Did you know most subscription-based genealogy websites make some of their databases available for free? They do this so you can get a taste of what using their site will be like. The databases they offer range from very narrowly focused ones (such as the New York Marble Cemetery Records, NYC, 1830-1937 on Ancestry.com) or large databases with millions of records (such as the 1880 U.S. Census available for free on Ancestry.com). In the March/April 2016 Family Tree Magazine, my article features 50 free databases you can access on subscription websites such as Ancestry.com, Archives.com, Findmypast, WorldVitalRecords, MyHeritage, Fold3, and AmericanAncestors (the site run by the New England Historic Genealogical Society). Homestead Records, Broken Bow, Nebraska: This database of more than 39,000 records includes land-entry case files from the Bureau of Land Management’s Broken Bow Land Office from 1890 to 1908. Each entry in this database includes the person’s name, date, place, certificate number, and legal land description. Piotrków Trybunalski, Poland Marriages, 1808-1870 and Deaths, 1808-1888: In addition to the births database for this location mentioned in the Family Tree Magazine article, MyHeritage.com has two additional vital records databases: one for marriages (containing more than 4,000 records) and one for deaths (containing more than 10,000 records). Scotland, Selected Prison Registers, 1828-1878: Information in these 15,000+ records includes the prisoner’s name, year and place of birth, year and place of imprisonment, place of residence and occupation. Genealogies of Ware, Massachusetts, Families: Use the Keywords field on the search form to search this database for a specific name. Deseret Iron Company Account Book (UT): According to Fold3, these “ledgers list the names and occupations of the workers and amounts credited for their services.” The workers include iron workers and others associated with the Deseret Iron Company in what is now Cedar City, Utah. Flossenburg Entry Registers: This database includes more than 75,000 records of French, British, Canadian, and American prisoners of war; Jews from Poland and Hungary; and French, Belgian, Italian, and Yugoslavian political prisoners who were taken to Flossenburg Concentration Camp during World War II. Got a huge collection of genealogy books, as well as other books and movies? It might be time to consider using a personal library app to keep track of them. Some of the apps are free, and the paid apps often offer “lite” or ad-based versions for free so you can try them out before you buy them. Most let you automatically import a book’s information using a barcode scanner or by entering the book’s ISBN or UPC code. For more details on what each of these apps has to offer, check out my article on page 68 of the September 2016 Family Tree Magazine. Freelance writing is a career path that’s a mystery to most. The type of work you can do as a freelance writer has endless possibilities—from writing copy for ads and marketing brochures to writing articles for newsletters, websites, magazines, and more. As a freelance writer, I enjoy writing articles for newsletters. Recently, I wrote a few articles for a newsletter published by Iowa State University’s Center for Industrial Research and Service (CIRAS), which is the manufacturing extension partnership organization in the state of Iowa. Writing for this newsletter provides a unique opportunity to interview individuals and learn about the amazing things going on at Iowa companies, as well as ways the work done by Iowa State University faculty and students impacts the state’s economy. Check out my latest newsletter articles in the CIRAS News Fall 2015 newsletter (see the articles on pages 4-5, 8 and 14). If you’re looking for a place to house your family tree online, consider the FamilySearch Family Tree. This tool on the free genealogy giant website FamilySearch.org lets you build your family tree as part of a world tree, which allows you to collaborate with others on your family history research. By building your tree on this site, you can get Record Hints for historical records on FamilySearch.org that match your ancestors, as well as research suggestions and tips on possible data errors or issues. For a quick step-by-step primer to build your family tree on FamilySearch.org, check out my tutorial in the December 2015 Family Tree Magazine. As the largest free genealogy website—which is rapidly adding historical record images—FamilySearch.org should be a frequent stop for any family historian. And don’t let the simplicity of the search form fool you: As I share in the Unofficial Guide to FamilySearch.org (Family Tree Books), there’s much more under the hood here to help you ferret out your ancestors’ records from the gazillions in the site’s collections. Let me introduce you to tricks for searching the historical records databases on Family­Search.org and arm you with strategies for finding the family history records you need. 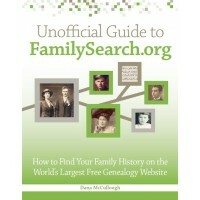 Read the full excerpt from Unofficial Guide to FamilySearch.org to learn how to capitalize on your searches of FamilySearch.org’s historical records databases. This year, I’m continuing this new tradition of taking a look back at the previous year as I begin a new one. 2015 was a year full of many professional and personal milestones for me, including the writing and publishing of my first book and the birth of my first child. I also wrote several blog posts on my own websites, maintained the @DanasCreative Twitter feed, and worked with my publisher to market my new book through activities such as developing a contact list, writing story pitches to publications, writing blog posts, and setting up an Amazon.com author page and a GoodReads author page. In addition, I took maternity leave to get to know my new daughter. As I look back, I again feel blessed to have had many amazing opportunities this year. Thank you to all of my clients for allowing me to work on your projects. It is a pleasure to serve my clients, and I look continuing to meeting their writing and editing needs in the coming year.